I was amazed with the quality for this ring. The color is amazing and the surrounding stones are clear also and Sparkle really nicely. It was a win-win! 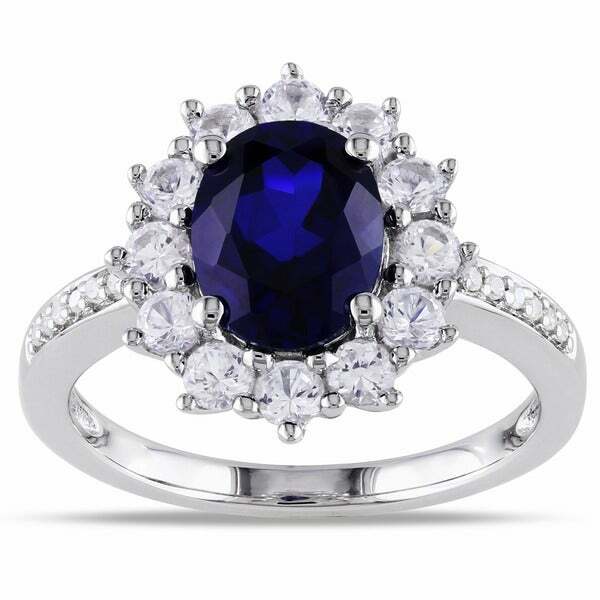 This stunning halo engagement ring from the Miadora Collection features an oval-cut created blue sapphire center stone that resembles the ring given to Kate Middleton. This pretty sterling silver ring is enhanced with created white sapphires and diamonds. This cocktail ring is a perfect gift for any occasion. All carat weights and measurements are approximate and may vary slightly from the listed dimensions. *T.W. (total weight) may vary and is a minimum of 0.045 carat. Treatment code CR (Created Blue and White Sapphire) and N (Diamonds). See Treatment Guidefor further information. I received this ring in the mail today. It arrived quickly without any delay. 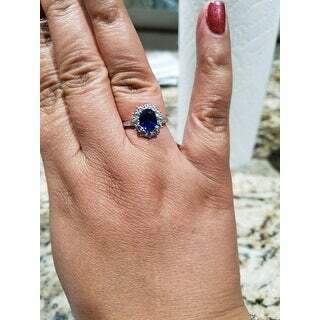 The center stone was larger than I expected and the created blue and white sapphires sparkled and was just beautiful! The blue was a very deep, dark, rich blue, and not black. The white sapphires were nicely set around the blue sapphire. The accent diamonds on the side were tiny and did not take away from the main setting. The silver band was a very nice thickness, not too thick and really appeared to look like white gold. The ring was very comfortable to wear. I bought this ring as a gift, but I just might get one for myself! This was my first order from Overstock and I am very pleased! 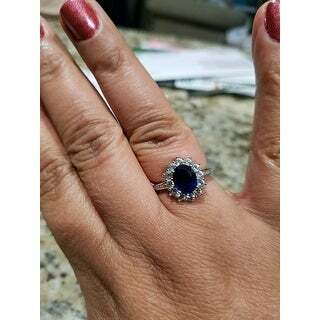 Very pretty ring, the sapphire is a nice blue and diamonds shine bright, looks nice on your hand not to big or too small. Very pleased with this purchase. Miadora Sterling Silver Sapphire and Diamond Accent Halo Engagement Ring well made and nice looking, I would recommend this ring for an surprise gift. I got a lemon BUT it sure is pretty! First off.... I got a "dud." What I received was scratched in the center of the stone. It was meant as an x-mas gift and I reallllllly wanted to exchange it for a ring that isn't scratched. Sure, it was absolutely a fantastic Black Friday deal. I just don't think I should have to settle for a scratched stone for the price cut. I put it on and really like it.. a lot! As of now, they are currently sold out. I'm going to request a replacement (IF possible) or a refund. Don't expect the diamonds on the band to be "bling." They're not. The white sapphires look awesome. Crossing my fingers for a replacement!! I also purchased the matching necklace. The pendent looks great. I've never been a fan of O.CO's silver chains. The person receiving it will put it on a white gold chain. If you're in the market for this ring (and obviously it's back in stock,) seriously consider the matching necklace. Some have complained the necklace is "small." I suppose I wasn't expecting it to be large. Not a scratch on the necklace! The two are a great gift combo. Just be aware the silver chain doesn't do the pendent justice! I did NOT get the matching earring. I'd imagine they are a great addition to the collection. Beautiful lab created center sapphire- just the perfect color, not too dark, not overly "lab-blue" if you know what I mean. Simulates a ceylon sapphire very well. The halo sapphires are also beautiful. Not much of a fan of the (really tiny!) diamonds on the sides of the ring, but honestly they don't take away from the piece either. For the price paid, I was a little fearful of receiving something cheap and tacky. Well made ring, and as long as it's really solid sterling I'm anticipating many years of beautiful wear! This ring is absolutely gorgeous. I love it. It looks real and extremely expensive. I get nothing but compliments when people admire it. The diamonds on the band are tiny but they don't look cheap they just look like tiny diamonds. The white sapphires are large and sparkle like diamonds. The blue faux sapphire looks like a real sapphire. It isn't a dark navy like some sapphires, it looks navy in most light but in sunlight it has a deep royal blue tone on the sides. I looked at a real sapphire ring that I have and it looks the same way it lightens in sunlight. So some will say it isn't dark enough but I feel like it is dark enough to pass as real. Overstock's picture makes the ring look huge but in reality it isn't a large ring at all. I wear it everyday and it doesn't show any signs of wear. I sleep in it, wash dishes, wash my hands and haven't had any problems. If you want a nice, elegant, believable cocktail ring than this is the one. I fell in love with this ring style and I was very happy with it when it arrived. It fit perfectly and looks amazing. I originally bought the ring for the center sapphire stone and am very happy with it. The diamond accents were a bonus, but they are so cloudy, you really don't notice them at all. I think this ring would look just as good if not better without them. The weight is also perfect. It's not too heavy and not cheap feeling at all. Highly recommend! Most definitely a 5 star review! This beautiful ring looks exactly as it was presented and is one of my favorite finds! The silver blue & white sapphire & diamond stones sparkle brilliantly & have elicited numerous comments every time I wear the ring. The sterling silver band assures me the finish of the band will not wear off. The diamond accents on the band adds a luster and dignity to the ring. I love it! I bought this ring because it looks like Kate Middleton engagement ring. I bought one that is not sterling silver for $10 and it started to turn color. So, I decided I am buying it in silver. When I got the ring I was very pleased. It looks pretty like on the picture, the stone has this rich blue color and small stones have lots of sparkle to them. The size is just right, I wear 5.5 on my ring finger and I ordered size 5.5. Perfect fit! It does not happen very often. I am very excited!! My next step would be to buy matching earrings. It is so amazing , the description posted on site was Really the one that was delivered and so great .The shipping was Free after several purchases online are made. I really love to go shopping on this site , and most of all i like the way they described the items in details. I can choose veriety of choices in every departments..And delivered at your doorstep. So wonderful. You are my favorite site during off work . More power to OVERSTOCK.COM ! This ring is absolutely exquisite. I have received so many compliments when I wear it. I have a real "princess Diana" ring which doesn't fit me anymore so I wanted a replacement one but didn't want to spend a lot of money. This ring is very similiar and I like it better because it sparkles more. I was going to keep this but I will get a replacement. Keep looking at the picture and my ring and they aren't the same. Mine is way too dark. Will take a shot at the replacement. I had a much more expensive version of this ring set in 14K with diamonds and a smaller sapphire. Unfortunately I lost that ring and was heartbroken. This was a replacement and though not exactly the same, it is very similar to what I had and at a fraction of the cost. Thanks overstock! Product looks nice and is a good replacement for my recently lost gold sapphire ring. Beautiful ring and saves tons of money being set in silver. No one questions whether its gold ir silver. Feels good to have some princess glam. This was a birthday gift for my sister who is in her 70's. She is a tiny person and has small fingers. I ordered the 5.5 and it fit her perfectly. It arrived the day before her birthday and she was so thrilled with it. She now has it to match the blue earrings and necklace and bracelet I gave her several years ago. She said the ring was beautiful and looked very expensive. She received many compliments on it at her birthday dinner party the next day. Thanks, Overstock for making my dear sister smile and enjoy her gift. Definitely liked by my fiance and recommended for purchase. This ring is stunning in every way. You will not regret purchasing it! This ring is absolutely beautiful! Sooooo worth the money! Fiancé loved it. Great at an outing. Looks very nice and well priced. Get it and the necklace and matching earrings. It all comes together nicely! The Sapphire is stunning and the diamonds around it just sets it off. My sister loves dark blue so I thought this would be a perfect birthday gift for her. Very pretty and elegant. I'm getting a lot of compliments wearing the ring. Very pretty - it looks a lot like Princess Diana's engagement ring. Very elegant-looking and not something wear every day. It's a good size that definitely gets noticed. "Can any of your contoured wraps or bands Work with or fit this ring ? I have one similar to it and was interested in the contour bands , my ring is the dimensions 7mm x 9mm"
"Are the sapphires created via flux growth or flame fusion? (It's a very importan distincton to make when buying lab created gems.)" "Are the sapphires lab created, lead infused or blue/white glass?" Hello Shuggerk, the sapphires in the Miadora Sterling Silver Blue and White Sapphire Ring with Diamond Accent, are lab created. Have a great day. "Is it lab-grade sapphire or CZ? does is come with certificate?" Hello Fei G., these are lab-created sapphires and real diamonds, no CZ, and the ring does not come with a cert. Have a great day! "Hi.. I'm in Nairobi Kenya and would like to order this ring, how long does it take to deliver? Caleb"
Hello Calebrity, delivery is 3-6 business days for most US locations. You will receive an estimated delivery date in the checkout screen. Please let us know if you have additional questions. Thanks for shopping with us. "how can i buy this ring.i live in kairouan _tunisia.?" Hello messaoudi, international shipping rates are calculated during checkout based on your service level, item type and quantity, weight, and postal code. Charges are available at checkout for review before you complete your order. Please let us know if you have additional questions. Thanks for shopping with us. "1 already purchase d the pendant , but trhe ring I can't find size 7?" Hello nancy, the in-stock sizes are listed from the options drop down box. Items are restocked as they become available; however, we cannot guarantee an item will be restocked. Thank you for shopping with us.